Basal earworms – This living fossil has not changed significantly in millennia. 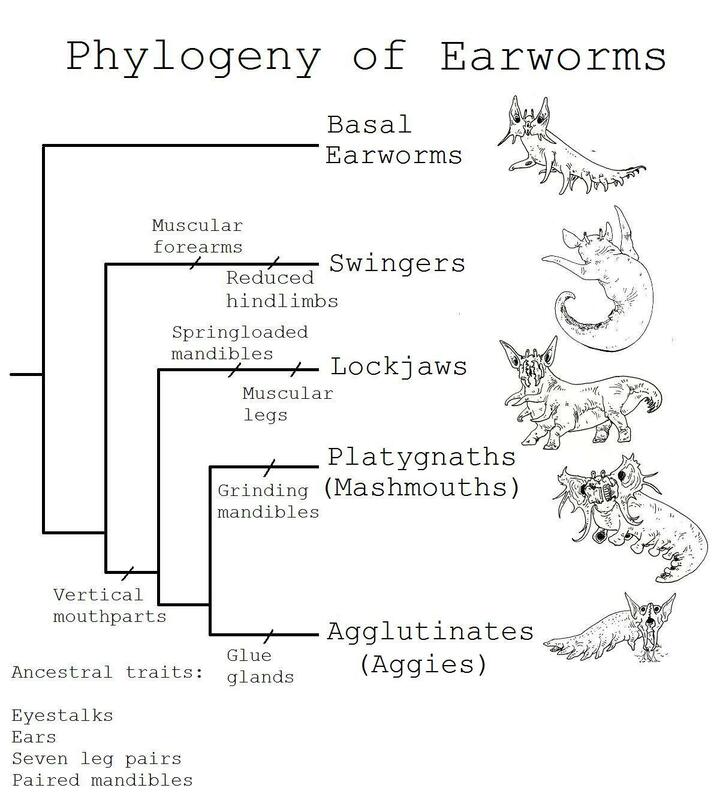 Apart from slender, finlike feet in some species, this clade has all the features of the earworms’ common ancestor. Swingers – An arboreal lifestyle favored the development of the front limbs at the expense of the rear limbs. The rest of the body acts as a limb on its own, making this animal an excellent brachiator. Lockjaws – In this group, it was the third and fourth limb pairs that developed a proper musculature for running. Lockjaws are named for their spring-loaded mandibles, which snap shut upon contact with prey. The force is enough to sever the neuroskeleton of almost any animal. Platygnaths – Their specialty is tough plant matter that other herbivores leave be. Their mandibles have flattened into a grinding surface sometimes lined with a razor edge for stripping the microphylls off of black plants. Agglutinates – These predatory stalkers are capable of secreting a glue-like substance from their oral glands. Their traps take many forms, from hidden webs to minefields of false dew. The giant earworm is the fourth longest land animal on Ilion and the second heaviest. While slow, a thick coat of slime protects it against most predators and it can deliver a crushing bite if disturbed. The plains lockjaw is a heavily built predator that has adopted a quadrupedal gait. Its legs are built for shock absorption rather than speed. Still, they are faster than their prey and that’s what counts. Plains lockjaws are pack hunters. They use their spring-loaded mandibles to hold onto prey and puncture a major blood vessel located on the ventrum. Although the hunt we observed was unsuccessful, it was clear what they were trying to do. Six ribbons of flesh hang raggedly from the tail; their function is unknown. However, we are fairly certain they are modified legs. Together with the four stout running legs and an additional two pairs of grasping forearms, they add up to fourteen. And as we know, fourteen is the standard limb number for Ilian land animals, with a few exceptions. Lockjaws’ ancestral resemblance to worms has been lost to selective forces, molding them into sturdy predators. The plains lockjaw, like many lockjaws, has a tail made of vestigial limbs appended to what remains of the body’s back end. This species evolved its tail to serve two proposes: display and feeding the young. When in season, the male grows out its colorful tail ribbons to excessive length to attract females. Once bonded, the female nibbles down his tail until only stumps remain, which will grow back once their offspring are weaned. The flesh is fatty and nutritious and the male isn’t the only one who produces it. After a litter is born, the female’s tail also hypertrophies to provide sustenance for the young. The tissue heals quickly and lacks nerve endings during this phase of the reproductive cycle.